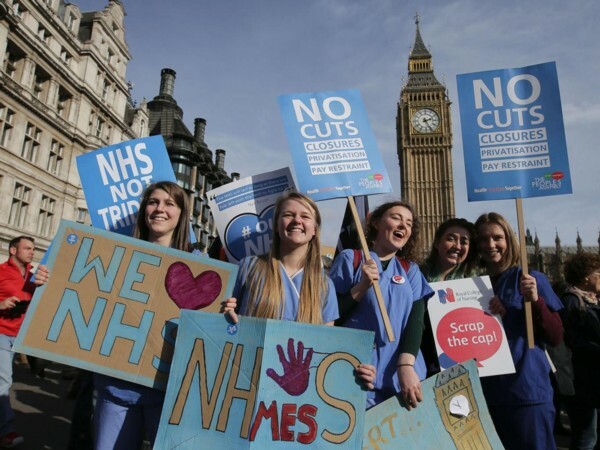 Protesters at a demonstration against cuts to NHS funding in central London [Image: Getty Images]. These BMA doctors are right. If NHS Improvement had anything good to report, you can be sure these Freedom of Information requests would have been serviced in full. Your minority Tory government is selling your health – and not even for a profit. Doctors have warned that plans for “brutal” NHS cuts are shrouded in secrecy and will cause uproar once revealed. The British Medical Association (BMA) says health service leaders have refused to publish details of the proposals that could extend waiting times, reduce access to services, cut down on prescriptions and treatments, and even merge or close hospitals and facilities. The proposals are being discussed under the capped expenditure process, which was introduced this year to cap NHS spending in some areas in order to meet so-called “control total” budgets in 2017-18. The BMA submitted Freedom of Information requests to NHS Improvement and each of the 13 areas, asking for the proposal documents. Eight of the 13 areas responded but, according to the BMA, none of them provided the full document or any significant details. I was supposed to see a SPECIALIST months ago about my Epilepsy after the change of medication, again, but haven’t had an appointment they just don’t want to know! Another phase in the nasty underhand Tory plan to get rid of the NHS. The STP proposals are clearly slash trash and privatise, and what is worse is the amount of money being spent on private companies to come up with these proposal. arent we having to spend enough already to maintain our conditions?i already pay full price for gaviscon advance and one of my 2 antihistamines. because the alternative generic gaviscon substitute both looks and tastes so vile your gipping before the first spoonful gets near your mouth. and im supposed to take 4 at bedtime so i dont get acid coming back up and burning my throat. i am finding it very hard to get to the cheapest chemist for this. i offered to pay full price for the original one but i would have to either go pick it up myself adding another 6quid in taxi fares onto the 11 quid the 500 ml bottle costs in most chemists because the chemist only delivers prescription only meds(even though it is prescribed for me . but if i want it prescribed now(the original stuff not the sub) i have to pay yet another 6 quid for a private prescription every month .. still as bad either way.im a pensioner with a couple of exempt conditions. What to expect from a lying tory, more cuts and look how well they done with them,i don’t have to use a example here, then what do we have next well the fabled experts from the dwp, led by three companies who have deniability issues when someone complains,it is honestly easier to get a pound of flesh than a open answer from them and if tory thinks that is going away, it is not,considering the dwp outsources these assessments to the three companies then they must have some accountability for the poor quality of these reports,that has not been hammered home to them yet,it is coming. so what is tory incompetent,lying, unfit for purpose, misconduct, spending on things that cannot be used when some high rise fire tenders may have been a bit more of a wise investment than some riot control vehicles. no doubt there still strong and stable,what in I don’t know, there own inadequacies maybe, don’t give them responsible jobs, that could be to frightening!! !